The register of marriages for Cape Girardeau, Missouri records the name, residence and age for each bride and groom. You can view the entire register on FamilySearch. 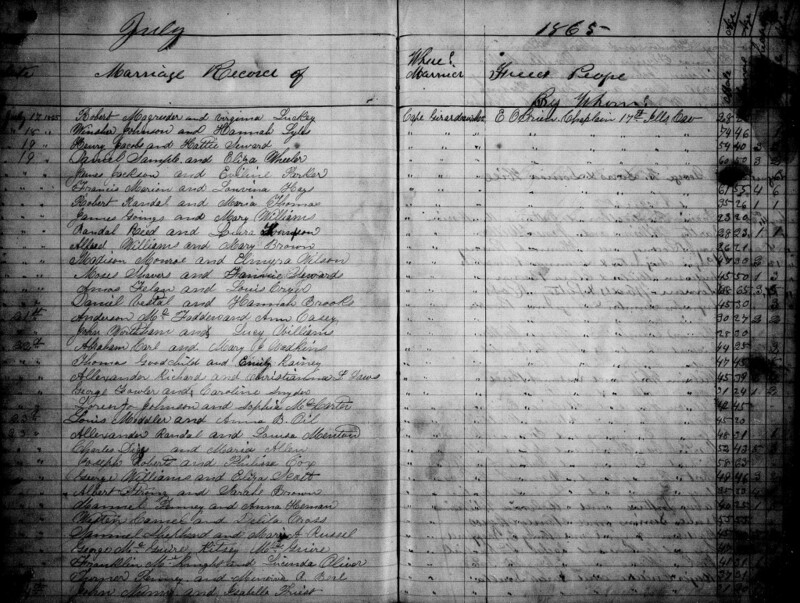 “Missouri, Freedmen’s Bureau Field Office Records, 1865-1872,” images, FamilySearch (https://familysearch.org/pal:/MM9.3.1/TH-1951-46309-1674-64?cc=2333775&wc=92YJ-HZH:1073776802,1073777605 : accessed 27 December 2014), Office of the disbursing officer (correspondence) > Roll 24, Register of marriages at Cape Girardeau, Jul-Aug 1865 > image 4 of 5; citing NARA microfilm publication M1908, National Archives and Records Administration, Washington, D.C.